Archived Mystery Review: M. K. LORENS – Sweet Narcissus. M. K. LORENS – Sweet Narcissus. Winston Marlowe Sherman #1. Bantam, paperback original; 1st printing, April 1990. A mystery introducing Winston Marlowe Sherman, semi-retired professor of English, pseudonymous author (as Henrietta Slocum) of the G. Winchester Hyde mystery novels, and in his own right, the most overtly eccentric character in detective fiction since Gideon Fell. Unfortunately, that’s all he has going for him. The first 100 pages or so are readable, mostly because of the characters, but only three really interesting things happen in all that time. That’s 30 years worth of book time, and it’s far too slow. (2) Thirty or so years later, some of the other items in the same collection are donated to Sherman’s school, but when they arrive, they’re discovered to have been severely vandalized. (3) The manuscript is found, hidden all these years in a secret hiding spot under the lid of an ornate lectern. Where I really lost interest, though, is on page 110, when Sherman gets down to the business of checking out the alibis of the people at the party where and when the manuscript first disappeared, only a few decades late. The person who suffered the loss was the father of Sherman’s soon-to-be lifelong live-in partner, and apparently he wasn’t interested enough to check into the whereabouts of the people involved right then and there, when the skulduggery actually happened. I don’t believe it for a moment, and neither should you. — Reprinted from Mystery*File #22, June 1990 (somewhat but not significantly revised). Bio-bibliographic Notes: As I had discovered at the time I wrote this review, the use of initials was intended (one presumes) to mask the fact that the M. K. stood for Margaret Keilstrup. One wonders if such a device ever mattered to anyone, except maybe in the early days of science fiction, when it was believed that nerdy teenage boys were not interested in reading stories written by those of the female gender. This was the five of five cases tackled and solved by its protagonist, who really was (as I recall) a fussy old English professor. Three were published in paperback by Bantam in 1990, followed by two in hardcover from Doubleday in 1992-1993. A Movie Review by Jonathan Lewis: GEORGIA (1995). GEORGIA. Miramax, 1995. Jennifer Jason Leigh, Mare Winningham, Ted Levine, Max Perlich, John Doe, John C. Reilly, Jimmy Witherspoon. Director: Ulu Grosbard. There are few onscreen performances that I can think of where an actor so intensely takes on the role of the character so as to completely disappear into it. Heath Ledger’s uncannily vicious Joker in Christopher Nolan’s The Dark Knight (2008) is one example. Jennifer Jason Leigh’s performance in Ulu Grosbard’s Georgia is another. In one of the best performances of an actress in 1990s indie cinema, Leigh portrays Sadie Flood, a tortured lost soul who wants nothing more than to be a singer like her talented and successful sister, Georgia (Mare Winningham). She portrays Sadie with such grit, pathos, and tortured anguish that it’s at times almost painful to watch. But I suppose that was the whole point of Grosbard’s direction and his approach to the project. What is more sad – pathetic, even — than an artist who has no real talent, but has all the demons often associated with the tortured musical genius. Alcoholism, heroin, unstable romantic relationships, Sadie’s got them all and more. Not Georgia though. Georgia is emotionally distant, cold even. She’s married to the laid back Jake (Ted Levine), lives in her childhood home, and has two young kids. The contrast between these two is evident from the get go. But sibling rivalry isn’t the real them of Georgia. The film’s real theme is talent. Who has it and who doesn’t? Can talent be gained or learned or are some people just born with it? Who is more authentic? A singer with pure raw emotion and no talent or a completely talented professional with a cold heart and no real passion? Reviewed by David Vineyard: JOHN BLACKBURN – Broken Boy. JOHN BLACKBURN – Broken Boy. Secker & Warburg, UK, hardcover, 1959. Mill, US, hardcover, 1962. Lancer 73-475, US, paperback, 1966. Sphere, UK, paperback, 1970. Valancourt Books, US, trade paperback, 2016. Because it was summer, nobody considered the motive of the birds. And motive they have, namely to pick at the corpse of a young woman found in the river, stabbed and mutilated, drowned, and tarted out replete with all you would expect to find in a prostitute’s possession, save for one thing, the girl is a virgin. Thus begins one of the fine suspense novels by British writer John Blackburn (Ring of Roses, The Scent of New Mown Hay, The Gaunt Woman) featuring General Kirk, his brilliant and ruthless secret service chief, and various continuing characters, here Michael Howard and Penny Wise who first appeared in A Sour Apple Tree. Broken Boy is a detective novel and a thriller, but also a horror novel (some Blackburn novels are also science fiction of a very British tradition) with society itself threatened by outside forces. It deals with a witch cult, its historical roots found in the evil reign of Queen Ranavalono of 19th Century Madagascar, who reduced the population of her island by half during her reign (from five million to half that), the Broken Boy of the title being her weakling son for whom she ruthlessly tried to secure the throne (unsuccessfully) and the name of the cult Kirk must battle. In Blackburn’s novel a modern witch cult risen from the activities of a defrocked priest who aided Ranavalono to defeat a French invasion, poses a threat to modern England as bloody and dangerous as any political or scientific enemy, and to Blackburn’s credit it is all grounded in well observed psychology and believable motives. His heroes and villains are human, and more frightening for it. No one has to tone down their critical faculties to enjoy a Blackburn novel. This sort of thing has a long history in British thriller fiction dating at least as far back as Bram Stoker’s Dracula and Richard Marsh’s The Beetle, up through Sax Rohmer’s novels (both Fu Manchu and not), John Buchan (The Three Hostages) Sydney Horler (The Vampire). Dennis Wheatley, Francis Gerard’s Sir John Meredith series, John Creasey’s Dr. Palfrey tales, Philip McCutchan’s Commander Shaw series (especially the later ones), and works by John Christopher and L. P. Davies. Even James Bond encounters voodoo in Live and Let Die, Roderick Alleyn a cult in one of Ngaio Marsh’s books, and Albert Campion fantastic threats in several late Allingham entries. But few writers combined the elements as successfully as Blackburn, who ratchets up the suspense to unbearable levels while keeping the reader too distracted to notice how easily he is swallowing the whole thing. Whether his monsters are human or not Blackburn has a true gift for combining Gothic elements with modern concerns, and wringing the last drop of cold sweat from the reader without once going over the top or spoiling the game. That sums up the pleasures of a Blackburn novel as well, something “much more basic in every way,” than just a spy novel, detective tale, or horror novel. If you have never read Blackburn you are in for a treat, though I wouldn’t start one before bedtime if you expect to get much sleep. Reviewed by Walter Albert: Two Early WARNER OLAND Films from Cinevent 1990. THE BLACK CAMEL. Fox Film Corporation, 1931. Warner Oland (Inspector Charlie Chan), Sally Eilers, Bela Lugosi, Dorothy Revier, Victor Varconi. Based on the novel by Earl Derr Biggers. Director: Hamilton MacFadden. DAUGHTER OF THE DRAGON. Paramount Pictures, 1931. Anna May Wong, Warner Oland (Fu Manchu), Sessue Hayakawa, Bramwell Fletcher (Ronald Petrie), Frances Dade, Holmes Herbert (Sir John Petrie). Based on the novel Daughter of Fu Manchu by Sax Rohmer. Director: Lloyd Corrigan . As it turned out, Cinevent 1990 featured a number of films with Oriental characters and settings. The first of these was The Black Camel, featuring Warner Oland as Charlie Chan in the first film version of the Biggers’ novel. We were warned about the noisy sound track which did not, however, significantly reduce ny enjoyment in this well-made, atmospheric classic. Charlie’s co-star was Bela Lugosi skillfully playing a phony psychic who is advising an actress with a shady past, The print was worn, but the acting of a good cast shone through. The other Warner Oland starrer was Daughter of the Dragon, directed from a story by Sax Rohmer. An older Fu Manchu (also stouter, as played by the well-nourished Oland) comes to London after being thought dead for ten years to avenge the death of his wife and son. He murders Petrie (upgraded from Dr. to peer of the realm) but is himself killed, after pledging his daughter, Ling Moy (the beautiful Anna May Wong) to continue his mission. Unfortunately for the honor of the family, Ling Moy is not, unlike her father, ruthless and she falls in love with Ah Kee (Sessue Hayakawa), a Scotland Yard detective. The actors play with utter conviction in a plot riddled with contrivances as patently manufactured as the secret passage that leads from Petrie’s house to the Fu Manchu/Ling Moy residence. The superb cinematography is by Victor Milner who takes advantage of half-tones, London fog and menacing shadows to capture the nighmarish night-world of Oriental intrigue. The film is slow-paced but so arresting in the visuals that this is nor a major drawback. The Cinevent film notes claim that Oland “brought an almost spiritual suffering to the role [of Fu Manchu].” As I recall what I saw, there was an overlay of fatigue and sadness in Oland’s performance that might pass for spiritual suffering. I won’t argue the point. Mystery Review: COLIN ROBERTSON – The Yellow Strangler. COLIN ROBERTSON – The Yellow Strangler. Ward Lock, UK, hardcover, 1934. Cherry Tree, UK, paperback; no date stated (1950?). Hillman-Curl, US, hardcover, 1938. Thriller Novel Class #3, digest-sized paperback, 1941. I have to admit that I was out of step with this one almost all the way through — but not in a bad way. Colin Robertson has a long career writing mysteries, almost 60 of them between 1934 (this was his first) and 1970, many of them with what I assume are Scotland Yad inspectors, but some with people I know nothing about, such as Vicky McBain and Peter Gayleigh. In any case, the first chapter ends on a note that had me thinking detective puzzle: a mysterious, sophisticated woman who has just moved into Phillip Battersley’s building decides to throw a party for all her friends. But at the end of a short sketch she performs with a gentleman she knows, the lights go out and in the playlet she is supposed to be strangled. Suddenly she screams, the lights go on — and yes, you guessed it. She has been strangled in real life. Inspector Wilson put in charge of the case — his only appearance in a Robertson novel. But as it so happens, this is not a case in which all of the attendees of the party are suspects, with all of their motives and actions needing to be tracked down in detail. No, the dead woman was a member of a international gang of criminals who turned against their leader, but to their dismay, he escaped their plot and is now tracking them down and killing them, one by one. This turns the story around into an out-and-out thriller, the kind the British did so well back in the 1930s. As the title suggests, the killer is known as the “Yellow Strangler.” He even signs his cryptic notes to the police signed “YS.” He may be Chinese, but it is also assumed that it is a yellow mask that he wears, so perhaps he is not. It also turns out that he is also one those madmen who has a goal of obtaining immortality by draining the glands of living victims, whom he kidnaps for that purpose, only to be foiled every time at the last minute. So, all well and good, but I was distracted by all the fun I was having, and I forgot that maybe this was also a detective mystery, which in the final chapter, it turns out that it was. That’s one on me. Summing it up then, I really can’t recommend this to you or anyone else, unless you’ve read this far in the review, and said to yourself, this is a book for me. In that case then, it is. A Movie Review by Dan Stumpf: VOICE IN THE WIND (1944). VOICE IN THE WIND United Artists, 1944. Francis Lederer, Sigrid Gurie, J. Edward Bromberg, J. Carol Naish, Alexander Granach, David Cota, Howard Johnson, Herman Schumm, Louis Alberni and Martin Garralaga. Written and directed by Arthur Ripley. I was all set to watch something else after The Chase [reviewed here], but somehow the story of that film’s director, Arthur Ripley, stuck in my mind and I ended up watching this instead. It’s a film of deranged genius, as freaked-out as anything by Ulmer, Fuller, or Joseph H. Lewis. It’s also artsy, pretentious and incredibly cheap, but I got over that. There are some unsettling parallels here. It’s about refugees from war-torn Europe who want to get into the U.S. but have to settle for the Island of Guadalupe. They are victimized by the crews of “murder boats” who promise to smuggle them to the U.S. then rob them and dump them at sea. As if all this didn’t sound familiar enough, there’s a flashback to a lavish military parade in occupied Czechoslovakia, and a Nazi spin doctor explaining how a concert selection of Czech music was actually a tribute to their German liberators — before arresting the pianist. The star of this thing is suave, sophisticated Francis Lederer, and he spends most of it as a crazy mute, staring wildly into space. Quite a change from his usual air of slightly sleazy worldliness. As the film opens, he rushes soaking wet into a tatty waterfront bar, struggles to speak, then just sits at an old piano and begins playing classical music. Flashbacks eventually reveal that he was once a renowned classical pianist in Prague, until the Nazis marched in and began their program of cultural unity. When he plays Smetana’s “Moldau” (Google this and have a listen if you don’t know it off-hand), he’s arrested by the Gestapo and tortured until his mind snaps. In a rather unlikely moment he escapes on his way to a concentration camp, and a few scenes later he’s working on the crew of a murder boat. Which brings us up to the present (I think) where it seems he torched the murder boat and now his erstwhile co-workers are trying to decide whether to kill him or not. These marauders are a colorful lot, including Alexander Granach, who thinks it’s bad luck to murder a madman, J. Carrol Naish, who thirsts for revenge, and spaced-out David Cota, who wouldn’t mind murdering anyone at all, but likes Lederer’s piano-playing. I think this is what makes Voice work: Ripley’s loving attention to his characters, from Lederer’s tormented soul to Louis Alberni’s comically cheerful bartender, and even the Nazi torturer. They all take moments to be real characters, and it lifts the film from allegory to genuine drama. With its non-linear plot and non-existent continuity, Voice in the Wind is certainly not for all tastes, but I found it more like an experience than a movie — and one I won’t forget. 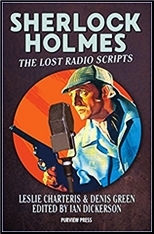 Book Noted: IAN DICKERSON, Editor – Sherlock Holmes: The Lost Radio Scripts. IAN DICKERSON, Editor – Sherlock Holmes: The Lost Radio Scripts, by Leslie Charteris & Denis Green. Purview Press, softcover, November 2017. I was nine years old when I first watched Return of the Saint. I think it’s fair to say that show corrupted me and changed my life. Okay, so maybe it wasn’t just the show that did that, but the books by Leslie Charteris as well. I spent years making sure I collected every possible Saint adventure, joined The Saint Club and was privileged to know Leslie and Audrey Charteris. I’ve also written a number of books about the Saint and Leslie Charteris and yes, there’s more to come. Around the same time I discovered The Falcon, the BBC were kind enough to show many of the Basil Rathbone/Nigel Bruce Sherlock Holmes films. Now that wasn’t my introduction to Holmes and Watson for I’d already read the works of Conan Doyle, but for many, many years after to me Rathbone and Bruce were Holmes and Watson. Then one day, whilst having a post-prandial coffee with a certain Mr Charteris, worlds collided for he mentioned that he wrote some Sherlock Holmes scripts with his friend Denis Green.. Over the course of our subsequent lunches (in a pre-internet age) he graciously answered my questions about them but since it was almost fifty years ago that he worked on the, his memory was not replete with the details I wanted. As the internet matured I managed to find out more details about the shows but no recordings or scripts from them. After Leslie died I got to know Audrey fairly well and we talked at length about many things. Occasionally she dropped hints that she thought some of Leslie’s Holmes scripts had survived and might be in their Dublin flat, but that was as far as I could get. After Audrey died in 2014 Leslie’s family asked me to go through their flat in Dublin. There indeed I found a stack of Leslie’s Sherlock Holmes scripts alongside many other gems. I was, needless to say, rather delighted. More so when his family gave me permission to get them into print. Reviewed by Jonathan Lewis – LEON M. URIS – The Angry Hills. 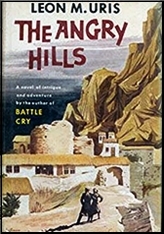 LEON M. URIS – The Angry Hills. Random House, hardcover, 1955. Signet S-1365, paperback, 1956. Several other reprint editions. Film: MGM, 1959 (with Robert Mitchum, directed by Robert Aldrich). As much part of the men’s adventure fiction genre as it is a spy novel, Leon Uris’s The Angry Hills offers up a panoply of thrilling and romantic scenarios for the reader. Written in an accessible style with little to no literary flair, the novel starts off strong only to peter out midway through. It’s a shame that the work never quite follows through on his promising opening in which developed his protagonist with seemingly great attention to detail. Michael Morrison is an American writer from San Francisco who finds himself in Greece around the time of the Nazi invasion during the Second World War. A recent widower, he’s in Athens and is saddened when he looks around city and wishes that his wife were there to experience it with him. Soon enough, he becomes embroiled in an international game of intrigue when he is handed a list of names that is vital to the Greek resistance movement and the Allied effort to assist them in the fight against Nazism. Morrison first impersonates a British officer, then a New Zealander. How he would accomplish with an American accent is not remotely plausible and Uris’s attempt to deal with it convincingly falls flat. The novel continues to pick up its frenetic, adventuresome pace until Morrison gets injured. He finds himself being nursed back to health by a Greek peasant girl. This is where the work begins its slow decline into formula. Enter not only the girl and her hearty Greek villager father who wishes to marry her off, but also a German officer villain with a riding crop who reads like he was written into the novel by Central Casting, and his sleazy overweight Greek collaborator friend. There’s some good material in The Angry Hills, including Uris’s depiction of the volunteer Palestinian (Jewish) Brigade in the British Expeditionary Force who fought on the Allied side in Greece. Morrison is a character that readers will find themselves rooting for, even if he cannot be completely distinguished from similar ordinary men in adventure fiction who find themselves swept up in a whirlwind of war and women. But the novel as a whole never really distinguishes itself. It’s a light read with little depth and one that gets increasingly predictable as it nears a conclusion that feels like it came straight from a Republic Pictures serial. A Mystery Review by David Vineyard: J. JEFFERSON FARJEON – The Z Murders. 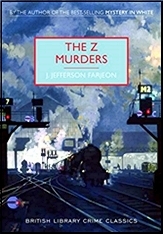 J. JEFFERSON FARJEON – The Z Murders. Collins, UK, hardcover, 1932. Dial Press, US, hardcover, 1932. Poison Pen Press / British Library Crime Classics, US, softcover, 2015. … there is one London you may never or rarely have met. It is the London of the cold grey hour, and you are wise to miss it for in its period and transition it has nothing gracious to offer you. Long before many of us became sick of the serial killer novel, there was the sequential or series killer, sometimes a madman, but more often than not a man with a plot that called for a series of murders either to enact it or cover it up. Many of the greats of the Detective story writers of the Golden Age mined these fields including such classics as Agatha Christie’s The ABC Murders, Francis Beedings’ Death Walks in Estrepps, and Philip MacDonald’s (writing as Martin Porlock) The Mystery of the Dead Police aka X vs Rex (MacDonald indeed wrote two others, the most famous being his last, The List of Adrian Messenger), and on this side of the pond S. S. Van Dine’s The Bishop Murder Case and Ellery Queen’s Cat of Many Tails. These differ wildly from the examples of modern writers, if in nothing but good taste and no love for gore for it’s own sake, but also in the fact the killer, whatever their motive, is more a natural force than a human. The game is the thing in these books, not the psychology of the killer or the sleuth (though that plays a role in the Van Dine and Queen titles mentioned). J. (Joseph) Jefferson Farjeon was a critic, historical novelist, and children’s author who also wrote popular mysteries. He had two series characters, Ben the Tramp (one of whose adventures was filmed by Alfred Hitchcock as Number 17) and a reformed criminal turned detective appropriately called X. Crook, but neither features in this entertaining melodrama that falls somewhere between John Buchan’s shockers and Michael Innes more playful thrillers in style and mood. Richard Temperley, our hero, is on his way back from the Lake District by train and spends an uncomfortable night in his compartment thanks to a noisy and unpleasant elderly man. When the train lays over at Euston for a few hours in the cold grey dawn Temperley and the elderly man both take refuge at a small hotel nearby, but no sooner do they settle in than the man is found shot to death in an easy chair, and Temperley catches a glimpse of a beautiful woman who promptly flees. Detective Inspector James shows up and while interviewing Temperley finds a curious crimson enamel metal shaped like a Z. Soon London will tremble before that Z.
Temperley finds the woman’s handbag, but like the lunk-headed heroes of countless adventures conceals it from the police — well, she was beautiful — and from it discovers she is one Sylvia Wynne of Chelsea. Naturally he goes to allow her to explain her obvious innocence, but finds her gone, and another enamel Z on her carpet. He does catch up to her, and finds her too frightened to talk, and loses her again, and chases her cross country for the rest of the book also pursued by the sinister Mr. Z (a really least likely suspect) through cliffhangers, improbabilities, and wild action. I will only say, Mr. Z is a nasty piece of work, and this would have made a fine Hitchcock or Carol Reed outing. This all works because unlike many in the same field, Farjeon could, and bothered to, write. His style has pleasing literary flourishes (never too much or heavy handed), humor, and a near Stevensonian sense of romance. Poison Pen Press has brought two Farjeon novels back into print in their British Library of Crime Classics series with informative introductions by Martin Edwards (to whom I am indebted for some of the material in this review), and yet another ebook publisher has released several of his Ben the Tramp novels. This may be dated, but it is tremendous fun and works on its own as an entertaining thriller with no reliance on nostalgia and no need for forgiveness, save some of the logic you still have to forgive the form today. Archived Review: ELLIS PETERS – The Confession of Brother Haluin. ELLIS PETERS – The Confession of Brother Haluin. Mysterious Press, hardcover, 1989; paperback reprint, December 1989. First published in the UK by Headline, hardcover, 1988. 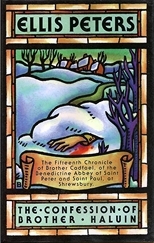 The 15th chronicle of Brother Cadfael. The year is 1142, and a winter’s accident nearly takes the life o Brother Haluin, whose sins (he confesses) include an unsanctioned love — and an abortion — and when he survives, his guilt is still very much with him. As in good science fiction, Ellis Peters has a special knack of sweeping us away to another time and another place with the greatest of ease. This is tasty and moody medieval fiction, taking place when the ways of the world were very different; it is also achingly good, but marred by a flaw that can’t help being noticed. All but one of the characters in this novel are perfectly realized, but the one who is not has a large role, and she just happens to be the mother of Haluin’s child. As every mystery reader will realize at once, neither the mother nor her daughter died in the attempted abortion, but Haluin does not know this, nor has the possibility ever occurred to him, and he has lived with the guilt for eighteen years. The mother of the girl he loved has suppressed the truth from everyone all this time, but Haluin’s pilgrimage to the girl’s home begins a chain of events that culminates in the death of an aged servant woman, who also knew the truth. All well and good, but you may find as much problem with this as I did. The girl herself is still alive; she is now in a nunnery; and she also know who and where Haluin has been all this time. Please forgive me, but not so. That was no crime. The crime — perhaps, I admit, from a present day perspective — was in allowing Haluin to live eighteen years in misery, thinking he was responsible for killing the one he loved. Or if this is not the way it was, then the girl’s story should have been told, and it it is not. The size of the hole it produces is not large and depends greatly on your own point of view, I’m sure. To me, however, it was evident enough for me to tell you about it here. Otherwise? A perfectly told tale. — Reprinted from Mystery*File #22, June 1990 (considerably but not significantly revised). You are currently browsing the weblog archives for February, 2018.